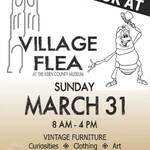 The Village Flea will feature vendors of true antiques, collectibles, vintage clothing, art, vintage home furnishings, and local artisan goods. there will also be local musicains, food, and dsnacks, This is a fmaily friendly event. General admission is $5,00 and children 12 and under are free.